In between designing and knitting toys, sewing and knitting for myself, and doing all the other things a mother of two little boys must do, I find a little time to make some special things for my boys. The last project was linen shirts for each, but the weather is now definitely Autumnal, and it was time for something more seasonal. For many months now, one of my boys' favourite cartoons has been Adventure Time. They both enjoy the heroics, silly songs, and memorable characters. (I also enjoy the messages of helping and friendship, and appreciate that my kids voluntarily skip the scarier episodes). Lev's favourite character from the show is Finn, and a new, plain black hoodie for school seemed like the perfect opportunity to make Lev a little something special. I made this patch from white cotton fleece and peach-coloured felt, hand-stitched together, then onto the hoodie. 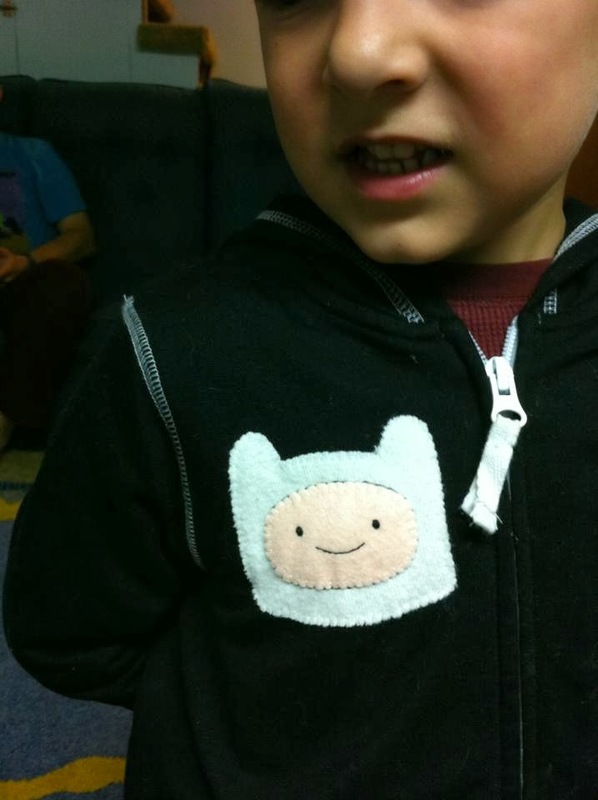 It helped that Finn's face is quite simple and recognizable, as my embroidery skills are not great. Anyway, we both love how it turned out, and Lev wants to wear it almost every day. Of course, when Kyr realized I was making something for Lev, he wanted something too (in fact, he made great big puppy eyes at me and started crying when he realized the hoodie wasn't for him). He didn't have a convenient plain sweater or shirt to embellish, and for a few days I was stumped on what to make for him. Then the weather turned a bit cooler, I pulled out his Fall hat one morning, and realized it was nearly too small. My choice of project was clear. 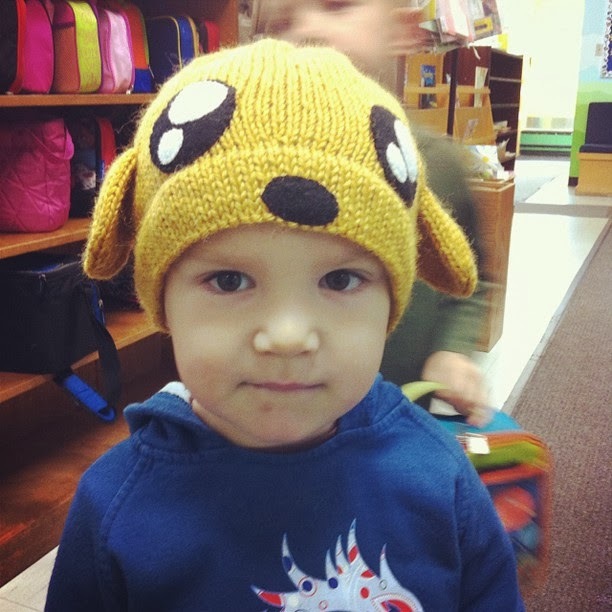 Kyr's favourite Adventure Time character, by far, is Jake the Dog (he actually calls it the "Jake-Finn" show). Luckily, I had 50 g of yarn left-over from a vest I'd knit Kyr a couple winters ago, in the perfect Jake colour. After a couple false starts, trying to sort out gauge and the brim style I wanted, I managed to knit a plain stockinette cap in just 2 evenings. Once I knew the fit was right, I added little floppy ears. However, it still wasn't recognizable as Jake, so I decided to add eyes and a nose with fleece patches. The finished hat is probably one of my most favourite projects, and Kyr loves it too! Posted by Barbara Prime at 10:06 a.m.
September 27, 2013 at 7:34 p.m.